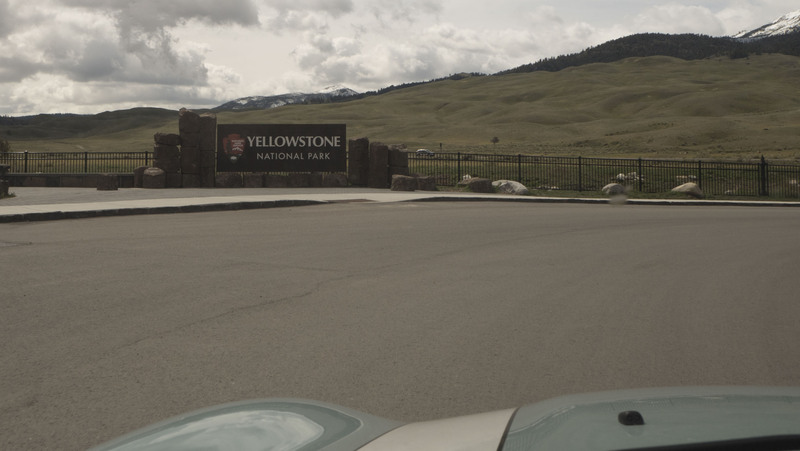 The First National Park to be established, Yellowstone National Park is one of the most visited and therefore crowded. I visited the park in early May, thinking I would be able to avoid some of the crowds and have a bit of the park to myself, I was wrong. Bus loads, upon busloads of foreign tourists, descend on the park. It seemed as if every pull off I tried to visit was mobbed. 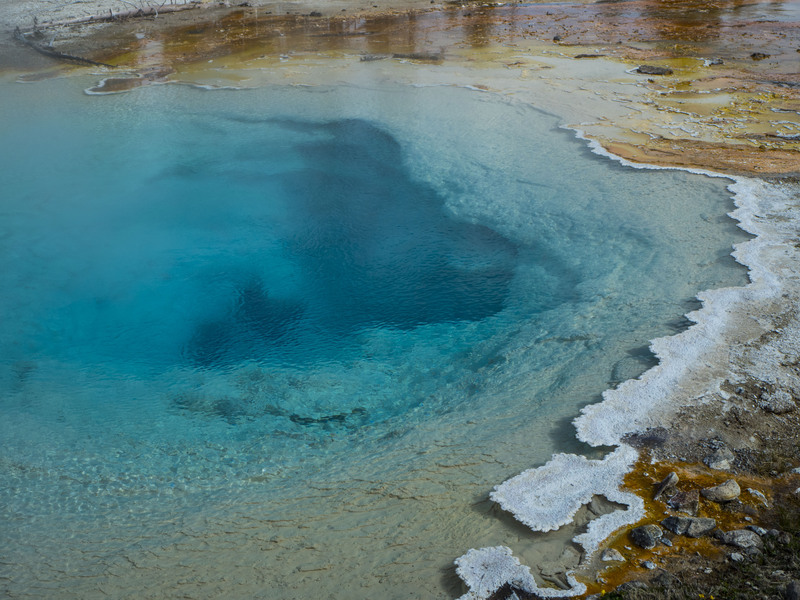 However, despite all of the tourists, you are able to see all of the grandeur that makes Yellowstone such a beloved must see. 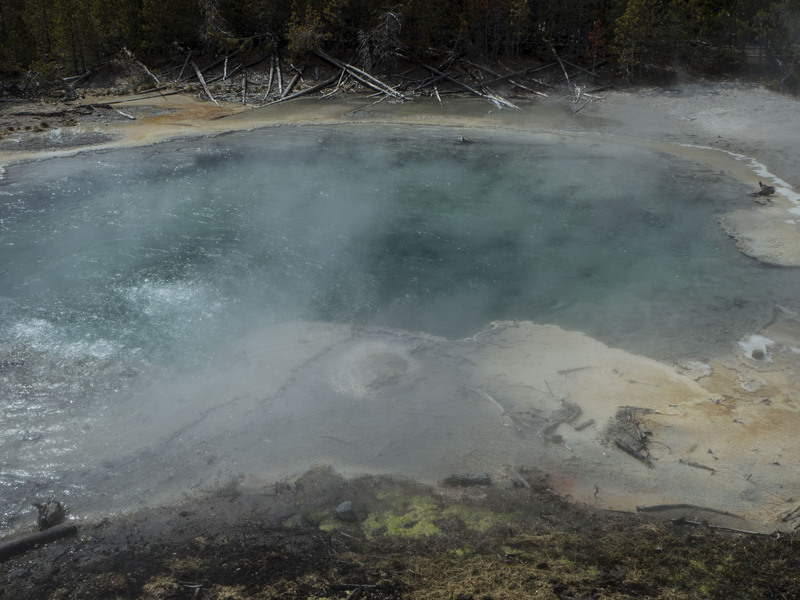 Yellowstone was established in 1872 by Ulysses S. Grant, however, it wasn’t until 1916 when the National Park Service was created that Yellowstone became the first park under their stewardship and became the Yellowstone we know today. I entered the park through Gardiner, WY. This town sits at the Northernmost entrance. 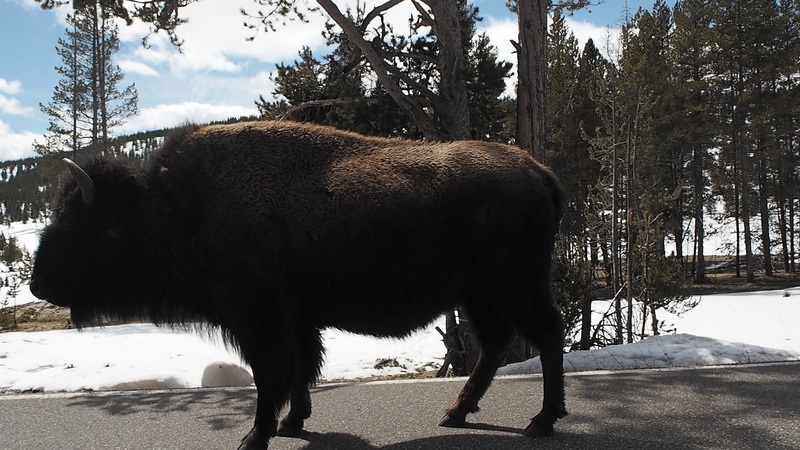 With elk grazing in people yards, you get a small taste of what you’ll see inside the park. My first stop was Mammoth Village, to get a little history of the place and a game plan for the day. Here you can explore Historic Fort Yellowstone, which housed part of the US Calvary from 1886 to 1918. You can take either take a ranger-guided or a self-guided tour, by using a pamphlet you can find at the Albright Visitor’s Center, once an Officer’s Quarter built-in 1909. The visitor’s center is a great first stop because you have the opportunity to talk with Rangers, pick up some bear spray, learn how to use it, and view a display of the various types of wildlife to look out for during your visit. If you plan on doing any hiking the bear spray is highly recommended. When I was there a lot of cubs were seen, since I was alone, I decided to forego the hikes. Here I learned about Forever Yellowstone, a fund-raising program used by the National Park Service to help keep Yellowstone alive. For a minimal donation of $25, you have donated to a charitable cause and you will be rewarded with 10% off all of your purchases for the year at any National Park or Historic Site. If you have a family that likes souvenirs, it adds up. Mammoth village has a couple of places to stay as well as a café and a gas station. 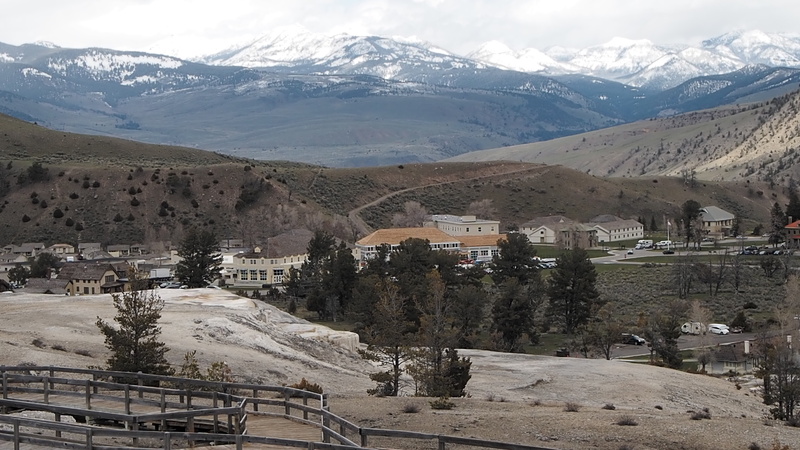 From Mammoth village, you can see the next stop on your journey, the Mammoth Hot Springs. 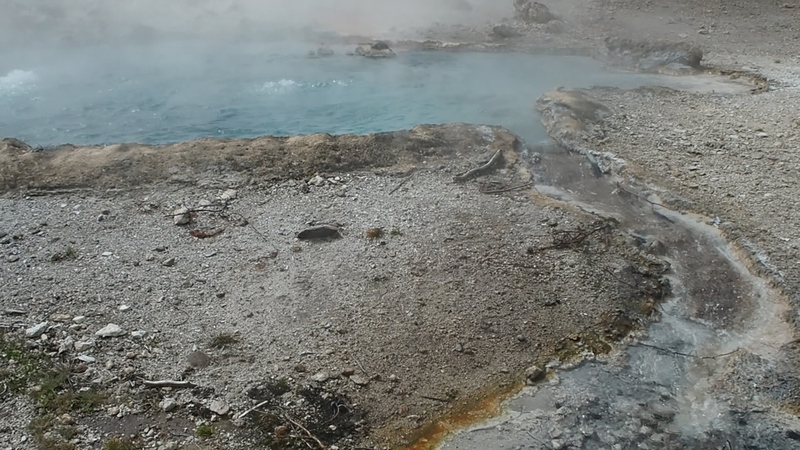 These terraced hot springs are quite captivating. 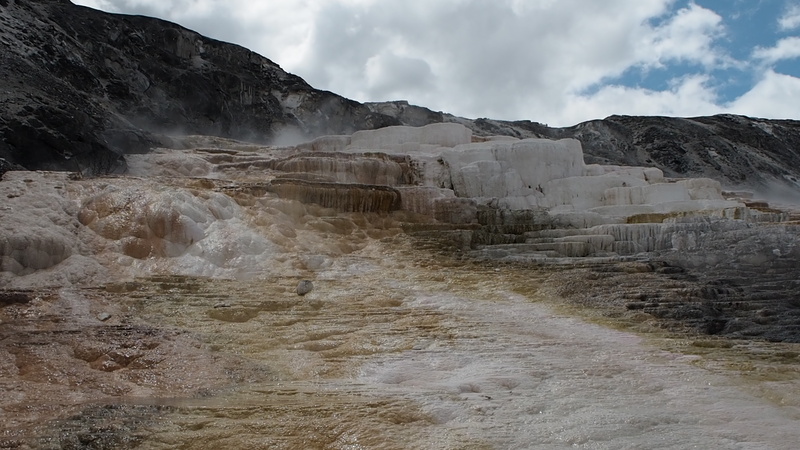 I spent a good couple of hours walking on their constructed paths and observing the flow of the hot springs. The variance in color and depth are beautiful. My favorite was the Dryad Springs on the Main Terrace. You can only get to it via the Upper Terrace Drive. If you park at the first pull off you have to walk along the boardwalk down to Dryad Springs. It’s a brilliant turquoise blue, that bubbles and steams. Well worth the walk. Along the walks, there are many other pools with to view. You will constantly see signs while in the park to stay on the paths. Reason being that if you step off the paths the ground may be unstable and because of the instability of the environment, you could be adversely affected if you were to touch one of the pools. 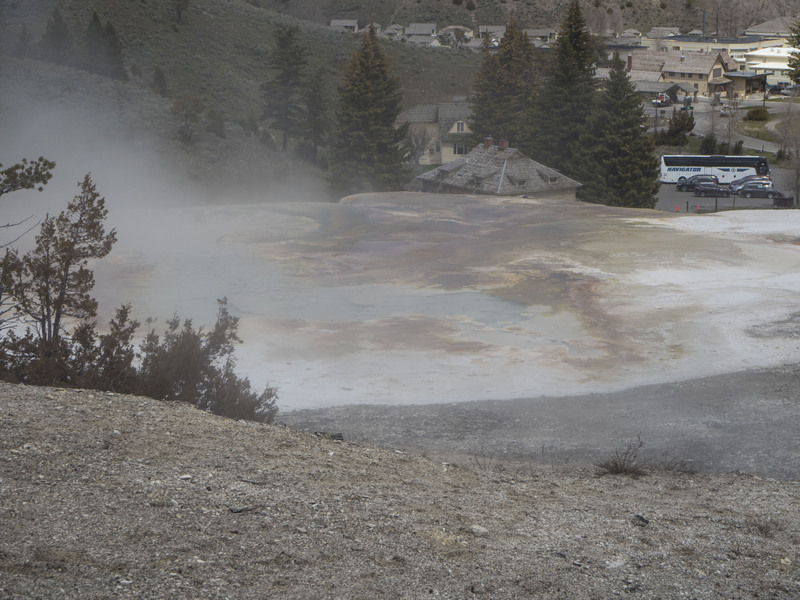 One thing to note, many of the pools, hot springs, smell strongly of sulfur. 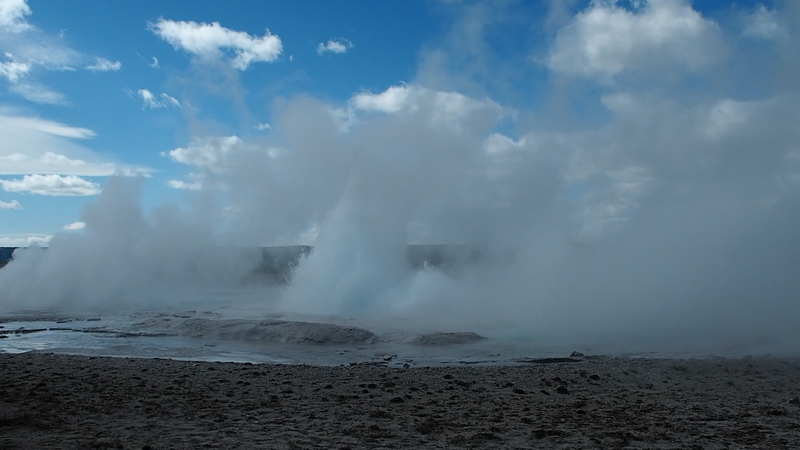 Some walkways will bring you quite close to certain pools and you may get barraged with sulfurous clouds. Apart from that, the scenery is beautiful. I chose to drive south to Norris Junction. 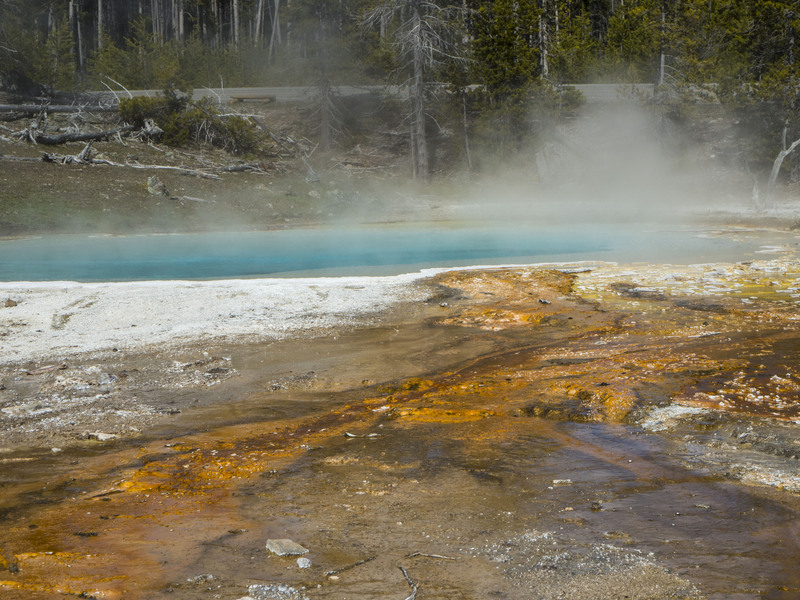 Here you can see the Norris Geyser Basin, which is home to over 50 geysers, mud pots, and hot springs. Also on this drive, there are plenty of opportunities to hike and view wildlife. It was where I saw my first Bison, walking on the road like it belonged to him. They are such huge animals. All I kept thinking while I was passing in my Mini Cooper was, “Don’t get spooked, please don’t get spooked and run me off the road.” He didn’t and I got a decent picture. 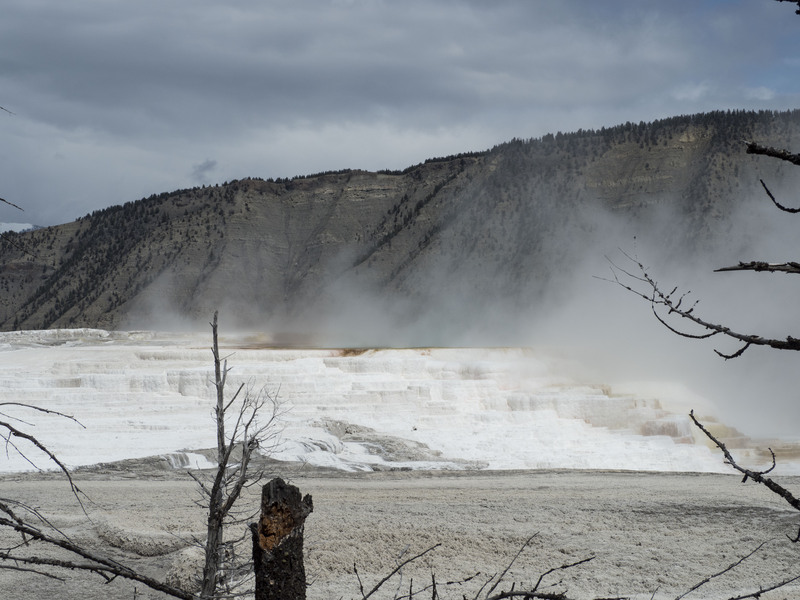 At Norris Junction, you have the opportunity to head south toward Madison Junction, which will lead you to Old Faithful or Canyon Junction and the eastern part of the park. I headed south toward Old Faithful. On the way to Old Faithful, I stopped at the Fountain Paint Pots. 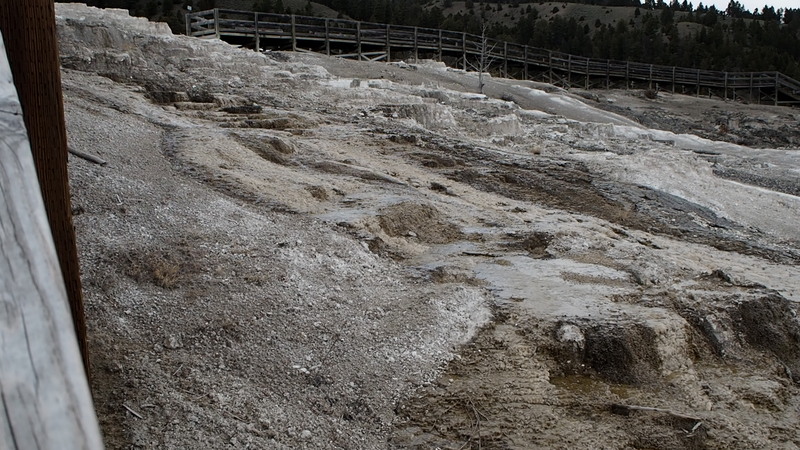 I wasn’t the only one with this idea, however, it was a great place to stop because in one loop you can see mud pots of all different types, hot springs, geysers which are spout almost continuously. 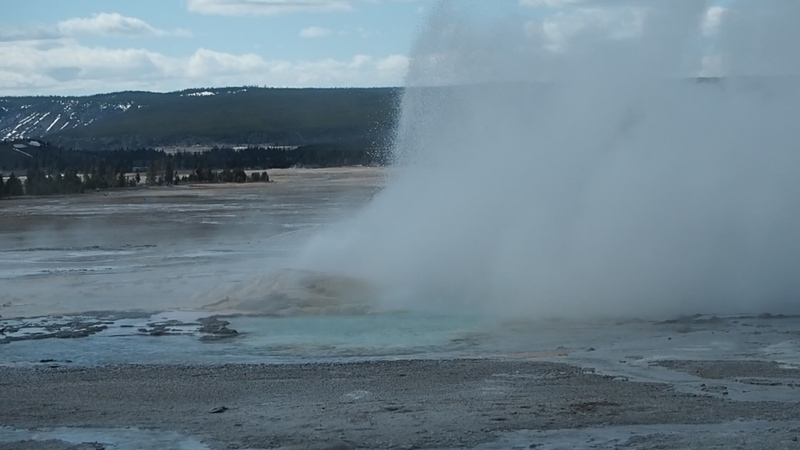 They may not spout as high as Old Faithful but you can also get a bit closer than they allow you to on any other geyser. 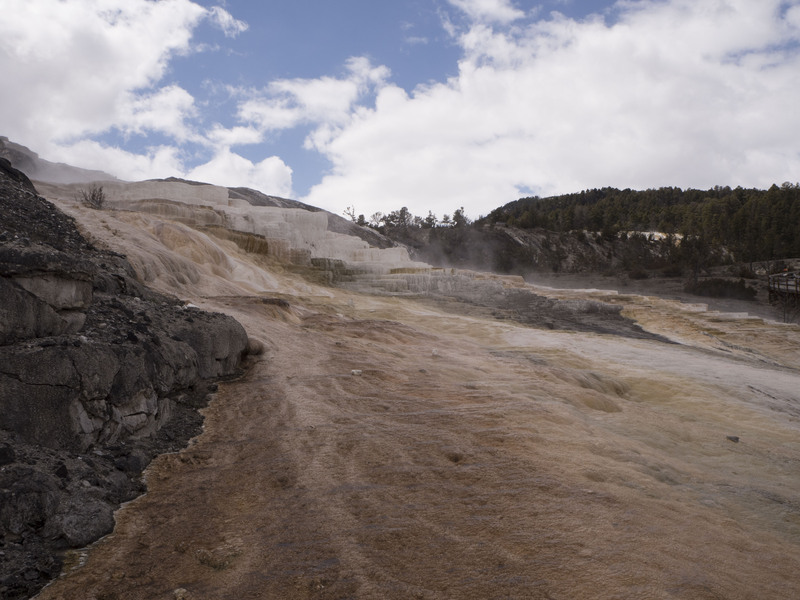 Thermal areas are everywhere, you are almost always guaranteed a show, wherever you choose to pull off and great photo ops. 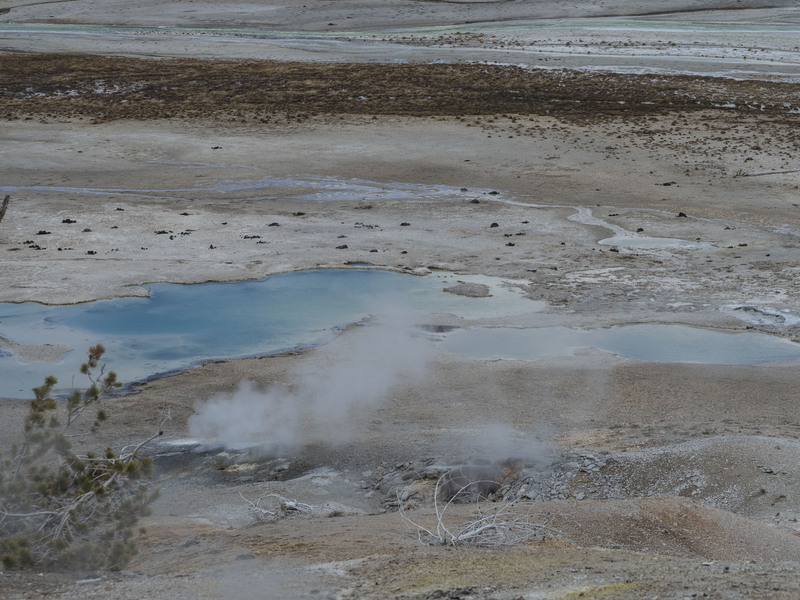 Just before Old Faithful Village is the Grand Prismatic Spring on the Midway Geyser Basin. 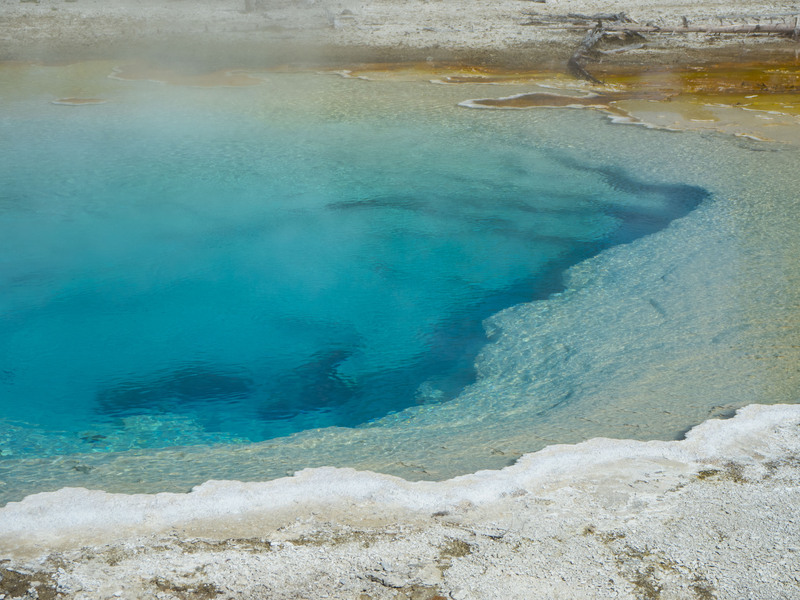 It’s one of the most photographed hot springs and one of the largest. It’s a rainbow of colors and my photos were not able to do it justice, nor was I able to get all of its grandeur from where I stood. My final stop on this trip to Yellowstone was Old Faithful Village. At that point, I was starving and getting a bit hangry at all the busses, so I knew I needed to eat. Fortunately, there are several dining options in Old Faithful Village. 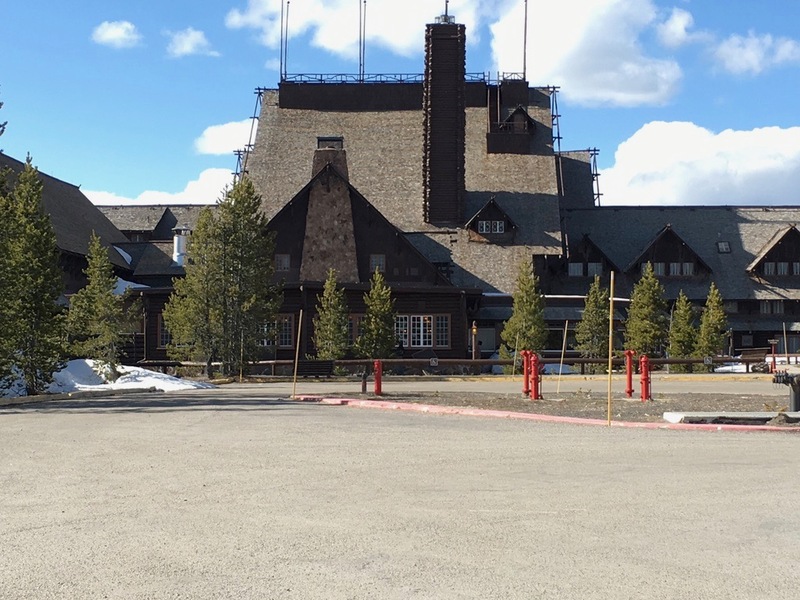 Unfortunately for me the place I really wanted to eat was in the Old Faithful Inn and the Inn wouldn’t be open for another week, however seeing the architecture from the outside and how it not only sticks out but blends into its surroundings was enough for me. 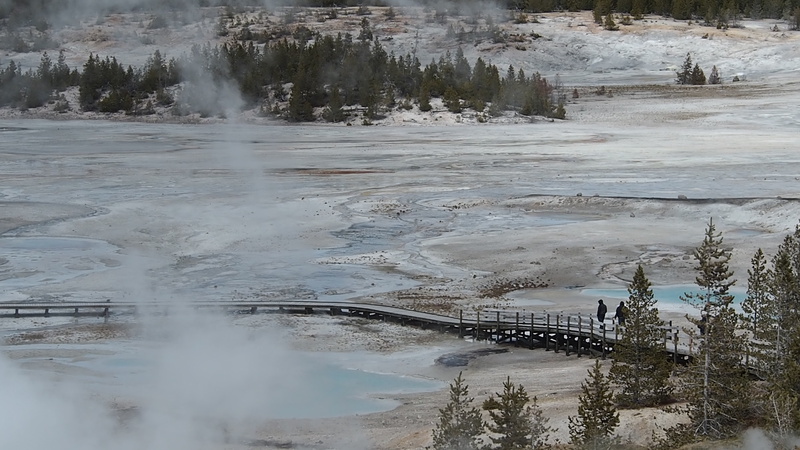 The Inn itself is situated so that guests could view Old Faithful from its veranda. Completed in 1904 the Inn was built to accommodate the large number of visitors who had come to view the Upper Geyser Basin. It is now a National Historic Landmark. 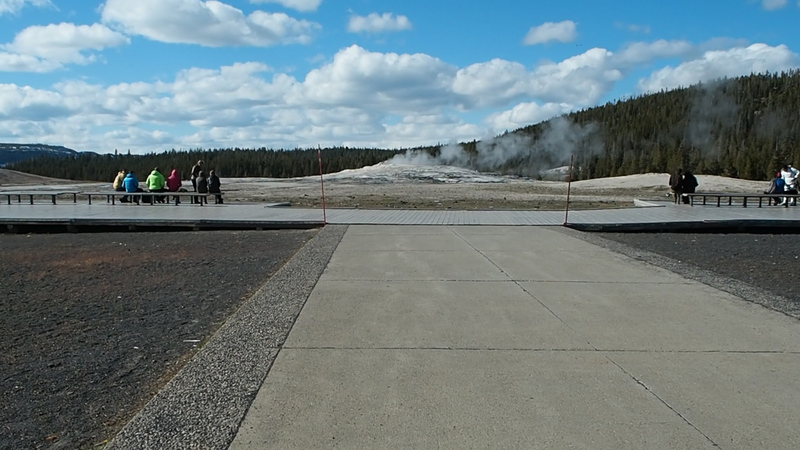 By the time I finished my meal, I had also just missed Old Faithful’s eruption. I was tempted to wait the next hour to an hour and a half for the next viewing but it was close to 7 pm and I still had to drive down to Jackson Hole, WY, where I was staying for the night. Unfortunately, because of the time I was visiting some of the roads were still closed due to winter conditions, I know can you believe it in May?! I had to exit the park near Madison Junction, making for a 4-hour trip to Jackson Hole, which would normally take 2 hours. A couple of things to keep in mind when visiting a National Park. Always check the Park website for updates on road closures and events. 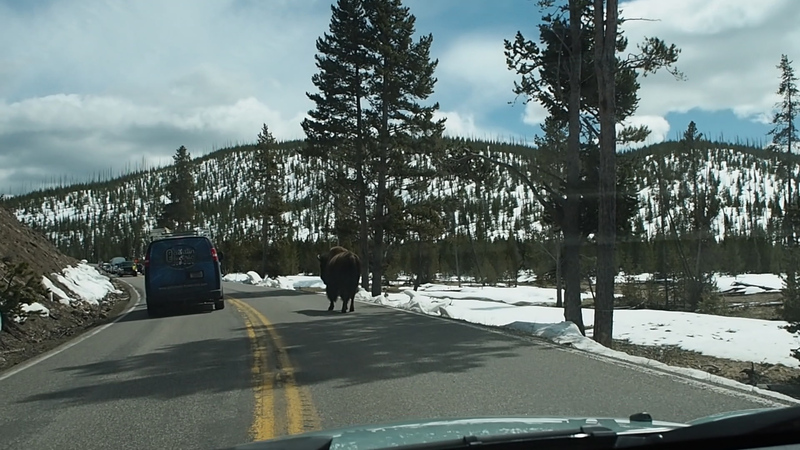 While in Yellowstone I knew that there were certain roads I couldn’t take and therefore certain attractions I wouldn’t be able to see because of winter conditions. This helped me to plan my trip and manage my expectations as well. Another tip is to always stop into the Ranger station or the Visitor’s center upon arrival. Here you can not only get maps but you can ask the Rangers for insider tips. They are the ones who are working at these parks year-round, they have knowledge that isn’t covered in guide books. Utilize it. Believe me, they love sharing their information. If you’re staying at one of the campgrounds in a National Park, make sure to check in with the Ranger on duty in that area. A lot of times I’m camping by myself and they will make sure to check in on me and I’ve even been invited to their cookouts, which makes traveling a more enriching experience. Until next time.